Midweek Brass | From the Seasonally Occupied Territories . . .
“We manage,” I like to say, trying to give the impression that it’s tough but we’re hardy and, well, someone‘s got to do it. Truth to tell, serendipity thrives in the Martha’s Vineyard winter. When a new week begins, you have no idea what you will have done when the week comes to an end. Here’s what I mean. Tuesday, Cynthia Riggs — author of the Martha’s Vineyard Mystery Series, host of the annual Groundhog Day party (a high point of last week), and possessor of one of the most fascinating work histories I’ve ever encountered — sent round an e-mail. 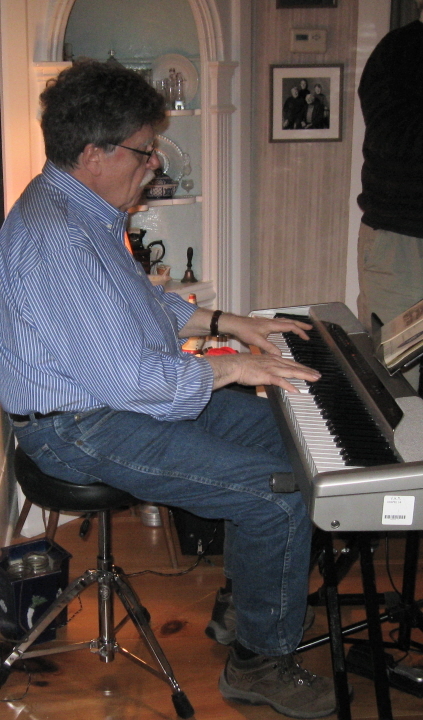 Her pianist friend Mark Wright was in town, so come on over Wednesday night for “another Cleaveland House spectacular!” Cleaveland House has been in Cynthia’s family for more than 250 years. An altogether wonderful place for parties, it’s also a B&B where poets and writers are especially welcome. 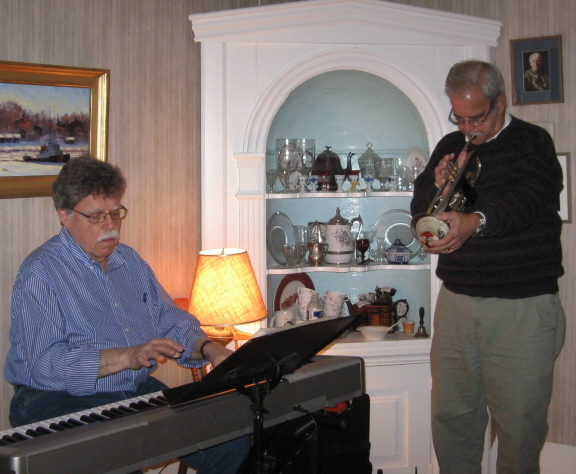 Featured would be Mark, who’s been a regular at Preservation Hall in New Orleans, and Ed Rodgers, a trumpeter retired from the U.S. Navy Band. And an array of desserts! 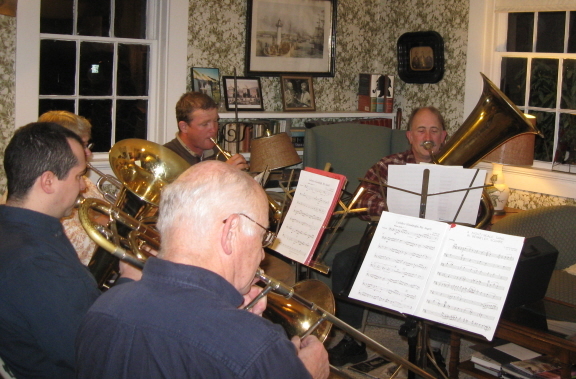 As it turns out, members of Vineyard Classic Brass wanted to attend, but they usually rehearse on Wednesday nights. Rehearse at my house! said Cynthia, and so they did — in the cozy front room where my writers’ group (from which I’m currently on blogging leave) usually meets. You’d think that much brass would blow the windows out of a small room, but it didn’t. They sounded great. Mark and Ed played in the dining room, where the table was spread with an array of desserts. My idea of “almost heaven” is a three-course meal, all of whose courses consist of desserts. I considered making it a four-course meal but had a second beer instead. If there’s anything better to do in the winter than listen to good music while chatting with neighbors and sampling desserts you rarely serve yourself, I can’t think of it at the moment. It’s not a bad way to pass a summer’s evening either. This entry was posted in music and tagged Cleaveland House, Cynthia Riggs, summer people, Vineyard Classic Brass, year-rounders. Bookmark the permalink. sounds like a terrific evening. i had dessert for dinner too, but just one course, and without the great live music.